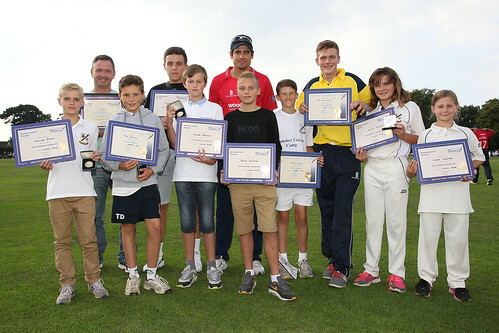 Upminster Cricket Club joined the Jack Petchey Foundation scheme in 2001 and since then, the club has greatly benefited from invaluable financial assistance from the Achievement Award scheme. The scheme has helped the club fund many projects, including the development of practice facilities for junior members; coaching courses for senior members and parents, who have then effectively coached the junior sections; and funding for an artificial wicket that we share with a local school. Not only does the Jack Petchey Achievement Award scheme provide financial support to Upminster Cricket Club, it also inspires our younger members to become actively involved with the development of the club. 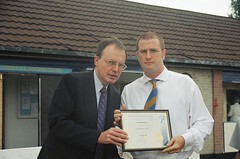 For example, previous Chairman and current secretary, Paul Middlemiss, collected an ‘Outstanding Leader’ award in 2003, when he was 24 years old. A mere five years later, Paul became the youngest chairman in the Essex Cricket League and he has been the driving force behind the club’s success and ascent into the Premier division in Essex League cricket. As well as the positions of chairman and secretary, Paul has also held the position of the junior section’s coaching co-ordinator and continues to spend an enormous amount of his spare time involved with the coaching and development of the club’s younger players. The Jack Petchey Achievement Award scheme has been instrumental in encouraging our young members to commit themselves to the club and to have their dedication and hard work recognised. Other club members that have received Achievement Awards as juniors over the years continue to remain involved with the development and organisation of Upminster Cricket Club. No fewer than seven of our current committee members have been recognised by the Jack Petchey Foundation, which is indicative that the Achievement Award Scheme encourages individuals to commit to clubs, schools and charitable organisations. 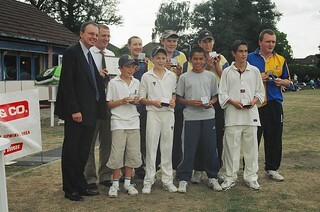 All of the recipients pictured above in front of the clubhouse in 2003, remain actively involved in the club and two of the youngsters have developed into extremely talented cricketers, making numerous appearances for the first eleven. In addition, in recent years, Jack Petchey’s ‘Outstanding Leader Award’ grants have helped the club to fund a new electronic scoreboard (2017); Portable net facilities (2016) and a bowling Machine (2015); which have been invaluable additions to the club facilities. As a club fundamentally reliant on members’ subscriptions, it would have been impossible to develop and improve our facilities, especially for junior members, without the valuable contributions that the Jack Petchey Foundation provides. The Achievement Awards Scheme provided by the Jack Petchey Foundation has enabled the club to improve and develop facilities for our younger members, who in turn, have committed and contributed to the club’s development. Long may our association with the Jack Petchey Foundation continue.